I don't know what else to call him. What else would you call a man who has survived an existential question six times in less than 10 years? 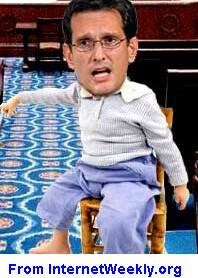 Why, yes, Eric Cantor did that. You see, this existential question is raising the debt limit. Amid ongoing negotiations with President Obama over raising the debt ceiling, House Republican leaders responded to Obama's call Monday for compromise by saying that their openness to raising the debt ceiling at all is sacrifice enough. "A vote to increase the debt limit in this country is an existential question for a fiscal conservative," House Majority Leader Eric Cantor said Monday. "These votes aren't easy. ...What I don't think that the White House understands is how difficult it is for fiscal conservatives to say they're going to vote for a debt ceiling increase." Yes, indeed. A vote to increase the debt ceiling is an existential question for a fiscal conservative like Mr. Cantor. You vote for a debt limit increase and your very existence as a fiscal conservative is threatened. And Superman Cantor has faced that threat six times in less than 10 years and survived! And then in October of 2008, Eric Cantor voted YEA on TARP, which also raised the debt ceiling to $11.3 trillion. That's six times in less 10 years, if arithmetic is any measure. In less than a decade Superman Cantor faced his "existential question" six times and six times, he emerged from the rubble of fiscal conservatism. I am speechless. I am not worthy. Or, I guess he might just be a drama queen. Or a crybaby. I guess this is what happens when President Obama tightens the knot around the Republican bluff on fiscal responsibility and puts the nail on the coffin on the canard that the GOP is or ever was serious about deficit reduction. Heh. And uh, this just for kicks: I just noticed a Google ad where Ron Paul is cracking the whip on Speaker Boehner for "betrayal." Ahahahaha. This is so sweet to watch! Maybe the Republicans will learn now the price of letting whackjobs take over and run their party. Too much to hope for? Ah, maybe. But for now, pass the popcorn!